The Milli-Speed switch sensor with 4-20 mA linear output signal is designed to detect belt slip, belt underspeed, stop motion, low speed or zero speed on bucket elevators, conveyors, air locks, mixers, fans, grinders and many other rotating machines. Totally sealed and simple to calibrate, the Milli-Speed works in the harshest of conditions. An analog inductive sensing device located in the nose of the Milli-Speed enclosure will detect a metal target. This target can be an existing bolt head or device attached to a shaft, such as 4B’s Whirligig® sensor mount. The Milli-Speed is designed to operate over a speed range of 20 to 3,600 PPM (4-20 mA output). During installation, the Milli-Speed is set to the normal running RPM by simple magnetic calibration (17 mA output). A 20 mA output signal occurs when speed is higher than the calibrated normal running RPM. A 4 mA output signal is produced when speed falls between 0 to 10% of the calibrated speed. The Whirligig is a fully guarded target for easy mounting of motion sensors. It is a universal shaft sensor mount suitable for all industry standard cylindrical or DIN style inductive sensors. 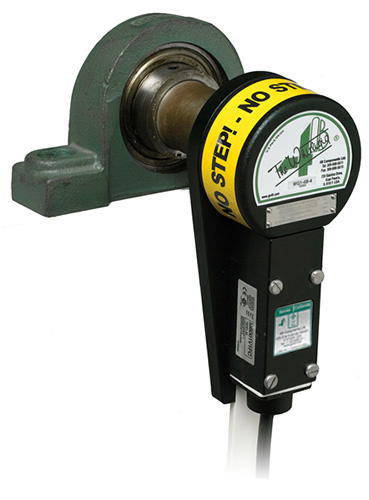 The Whirligig is available with 1, 2, 4 or 8 pulse targets, and attaches to the machines shaft by a 1/2 in. tapped hole or magnetically using the Mag-Con™ adapter. What voltage is needed for the Milli-Speed? The Milli-Speed is looped powered and requires 17 - 30 VDC. How do you calibrated the Milli-Speed? Why is the Milli-Speed not working when mounting to the Whirligig? flush to the Whirligig guard and target.